Anxiety is an emotional state, unpleasant in nature, associated with uneasiness, discomfort and concern or fear about some defined or undefined future threat. Some degree of anxiety is a part of normal life. Treatment is needed when it is disproportionate to the situation and excessive. 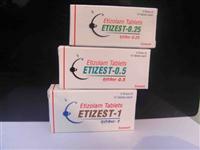 We are the exporter of Antianxiety group of drugs which are mostly mild CNS depressants and are aimed to control the symptoms of anxiety, producing a restful state of mind without interfering with normal mental or physical functions.